Saturday came with an early wake up due to game time being moved to 11am in an effort to beat the incoming thunderstorms. So it was up and at ‘em. First stop, a University of Houston bookstore and by bookstore, I mean, a place to get Cougar gear. This was not “the” bookstore but rather “a” store. As it was an early game, we decided to walk the campus afterwards. Psst, that did not happen. After getting some Cougar gear and changing into it, we toured the tailgates, or lack thereof. To be fair, this was an 11am game that was supposed to be at 2pm, and most people probably were not even aware of the time change. That being said, there were not many tailgates to see or talk our way into. We did some walking around, but decided to head inside TDECU Stadium. Apparently anyone can buy their way to naming a stadium including a credit union that is supposed to keep costs low as they are owned by the members. No sarcasm here. Al thinks this should be on our list of things to do after we buy ourselves an airplane. We were able to obtain pre game field passes for two, so we allowed the new guester Zack, to experience being on the field for all the pre game warm ups, rituals, and the like as well as the teams coming onto the field. This was not quite the experience it was at LSU or Ole Miss, but still something worth experiencing. Then it was time to head to our seats, and by our seats I mean, anywhere we wanted. Attendance was announced at 23,572 which would have made this 40,000 seat venue more than half full. Not even remotely in the vicinity of being correct. To be fair, it was more than Rice the previous night, but maybe it was 7,500. Anyway, we opted to sit in my favorite seats, first row upper deck, end zone. Yea, not going to happen. This was a much better game than the Rice / UTEP game from the night before, but I am still not going to provide full commentary. Mainly, because I was not paying that much attention. Tulsa put a scare in Houston. Houston was up 14-0, but Tulsa tied it up at 14. Houston would never lead by more than 7 until 1 minute left when the Cougars went up 38-28 which is where the game would end. It was a sloppy game that was tight, but you never got the sense that Tulsa would be able to pull it out so the score was somewhat misleading. That is all for game commentary. Al would like to note that of the 27+ trips we have been on, the band was the most imaginative of all with the song listed below, and the locomotive train sound effects. The most critical element of the game was, wait for it, that it ended before the thunderstorms began. 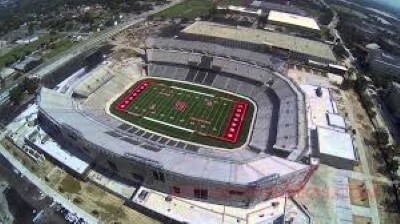 I will give the University of Houston props for one element, during a replay review, they played the Stevie Wonder written classic, Tell Me Something Good. Very appropriate! After the game, it was off to Gatlin’s BBQ for some local food, a place that came very highly recommended. We arrived at Gatlin’s and the line was out the door, but that is not unusual since it is a small place. When we reached the counter, our choices, were brisket or pulled pork. Those were my two choices anyway so no biggie. Upon sitting down and awaiting our food, we were told no more pork, so it was brisket or double brisket. Ok, so brisket it is. Al tried to trade his second brisket for usage of the employee bathroom without any success. At least the brisket was awesome. Really good and and an excellent smoke ring on the meat (please insert Al’s standard line here that will go unspecified due to the fact that this is a family publication). Nice! A little more choice would have been better but still an awesome meal. After Gatlin’s, we returned to the University of Houston to actually see the school. We arrived just as the rains did. We got out of the truly stupendous Chevy Impala to take the usual sign picture and then the skies opened. But we got the shot! And we didn’t get arrested by the police officer who was watching us look like idiots in the rain the entire time. So, the tour of the University of Houston amounted to us driving around since no one had the desire to get soaked again. I must admit, this is not really the best way to see a college campus. But you play the hand you are dealt. After the driving tour, we went back to the hotel so Brett could watch Boston College, his alma mater, lose to Florida State. I was pulling for you Brett. As regular readers of these trip reports are aware, we try to cram as much sports into the weekend as possible. So, night time brought us to Hofheinz Pavilion for the Morgan State Bears vs Houston Cougars basketball game. It is never our intention to bash schools, but you go to Hofheinz Pavilion for a basketball game and tell me with a straight face that this is not a ridiculous basketball venue. The ceiling is no more than 10 feet high and we played a game called just how much asbestos is in that ceiling. This is more like a theater where they happen to play basketball games. On the flip side though, if they ever hit capacity of 8,500 this place would be loud. And I mean louder than anywhere else. This could be a ridiculous home court when sold out due to its configuration and low ceilings. And credit where it is due, the Cougars have a solid basketball history and great tradition. Additionally, the half time hoedown was great fun. After basketball, we sought some food. After not getting into Twin Peaks (more on this place later) due to the Manny Pacquiao fight, not that we cared about that but it made the place busy with a $15 cover, we ended up at 55. 55 was not so great and the food was definitely subpar. But we got to experience what Brett felt like at the 80’s bar at Boston College, as this place only played Brett music videos. The all Brett channel, all the time. But UFC was on, so there was that. We had an evening flight back to New York, so what to do on a Sunday? After considering going to the Texans game or go karting, we ended up at a bar watching football. Did you really have any doubts? This trip we had three members of Al’s fantasy league. The bar of choice was Twin Peaks, a Hooters competitor, and exactly what you think it is. All we were missing was a place to charge our phones. If Twin Peaks had that, we may have never left, except to eat something remotely of nutritional value. As Manan previously explained to Al, this is a “high tech XXXXX bar”…and it is exactly that with the tv set up. It should be noted that two out of the three people in Al’s football fantsay league that were present at Twin Peaks made the playoffs, one did not. But Al shall remain nameless. Yes he is the defending champ, but not any longer. Al strongly points out for the record that he is the defending champ until the new champ is named. Just like an ex president is still the President during his second term or known as Mr President after his term ends. So please call me Mr. Champ 2013. I will not get into this debate again. And is should be further noted that Zack and I are playing each other in the finals. It was a full day of bar food, drinks, Twin Peaks entertainment, and NFL football before heading to the airport and our usual Sunday flight delays. We were delayed enough that time was occupied by watching the Giants – Cowboys now that Southwest has tv. Nice catch Odell but it was all for naught. After a delayed Southwest flight in cramped conditions, it was home sweet home. The Tulsa Golden Hurricane finished the season with a 2-10 record, 2-6 in the AAC. The Houston Cougars finished 8-5, 5-3 in the AAC. The season ended with 35-34 win over Pittsburgh in the Armed Forces Bowl. After the season, the Cougars fired head coach Tony Levine who had a 21-17 record in three seasons after taking over for Kevin Sumlin, but could not live up to the high expectations on the Houston program. The Cougars hired Tom Herman, offensive coordinator of the Ohio State Buckeyes, who will join the Cougars with a national championship ring after helping the Buckeyes beat the Oregon Ducks and scoring 42 points in the process.